While not mainstream in North American garden centers yet, micro-clover has been used as a ground cover and companion to turf grass in Europe for decades. Micro-clover is a dwarf-leafed, extra small form of the more commonly known Dutch white clover (Trifolium repens) which is locally used to create mixed or pure clover ground covers and lawns. 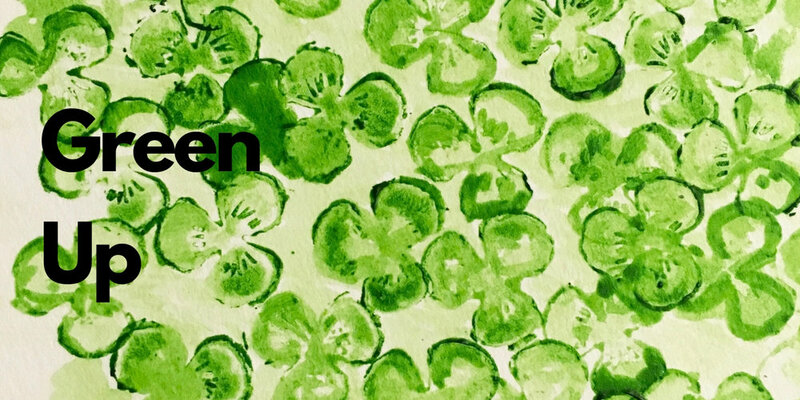 Like all clovers, micro-clover is a legume. It has the ability to take nitrogen from the air and aided by bacteria naturally occurring in plant root nodules, converts it into a form that is usable by clover itself and by neighboring plants. That’s why lawn grasses grow better when clover is present. Micro-clover is a better alternative to Dutch white clover because it mixes better with grass, matures at a lower height and doesn’t have a clumping growth habit. Unlike white clover, micro-clover has a small leaf surface which prevents it from being killed by natural weed management solutions such as the iron-based Weed B Gone. Don’t ever spray herbicides on a clover lawn. In addition to its natural nitrogen-fixing properties, this tiny leafed plant has some unique qualities that allow it to pack a big punch. THE SHE SHED is introducing this hard-working, dwarf, low growing plant this season. Here’s why. 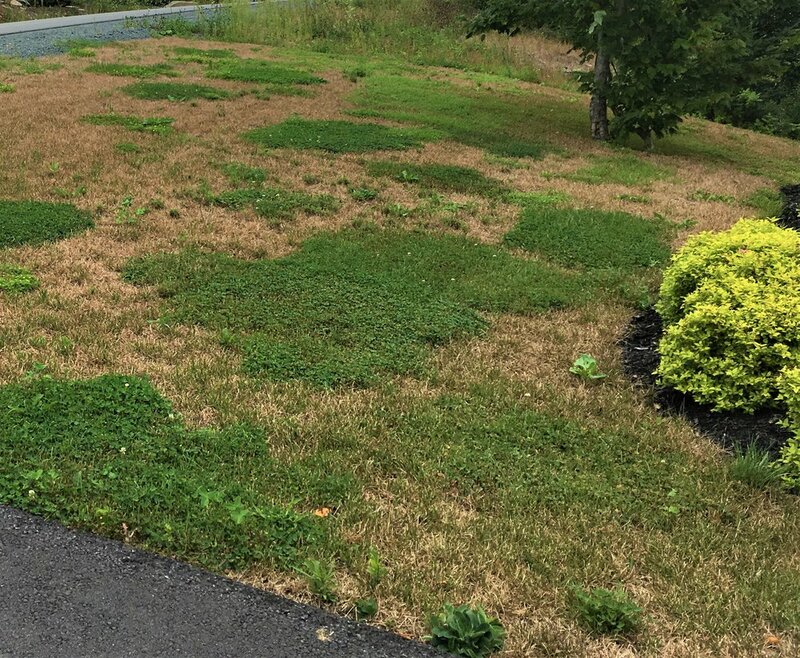 Summer drought and chinch bug have left this Kentucky blue grass lawn brown and unable to be restored. Any remaining green is…you guessed it…Dutch white clover. A mixed turf grass of micro-clover, fescue and perennial rye could have prevented the loss of the lawn. Appearance: Micro-clover’s miniature leaf size is less visible than the larger white clover leaf making it appealing to fastidious lawn-lovers who want to only see swaths of grass blades. Micro-clover is also popular as a companion to traditional turf grass because it’s deep roots allow it to be more drought tolerant than most grasses. This allows it to stay green in the hot summer months when grass is dry and brown (a thyme lawn is recommended where dry conditions are an issue). Resilience: Micro-clover is ideal for over-seeding lawns and sport turf environments. Wear and tear actually enhances its dominance in the lawn. Unlike sun-loving Kentucky blue and many grass seeds, micro-clover performs well in sun as well as part shade areas. Reduce thatch build-up: Thatch is a layer of living and non-living material that forms between the grass plant and the soil as the turf grows. Excessive thatch occurs as a result of fertilizer over-use. Thatch that is more than 1/2” thick is considered a problem because it attracts and harbors damaging insects such as chinch bug and can repel much needed water during drier months. Micro-clovers’ natural nitrogen fixing qualities help reduce the use of high nitrogen fertilizers which in turn reduces thatch build-up. Reduce environmental impact: Nitrogen is a key ingredient in lawn fertilizers and used to help grass grow. Too much fertilizer can have negative environmental impacts by causing excessive grass growth, increasing fuel consumption and emission pollutants from lawn mowers, and creating thatch which reduces healthy water consumption. Nitrogen leaches into soil with water and excess nitrogen can increase the risk of ground water pollution. Nitrogen based fertilizer runoff can severely damage marine ecosystems and can be deadly for marine life near shorelines. Reduce lawn maintenance: Hybrid ‘Pipolina’ micro-clover was developed for use in mixed lawn seed blends because it is more tolerant than Dutch white clover to the low mowing height most homeowners want for their lawn. It reaches a maximum height of about 5 inches; about 3 inches lower than the Dutch white clover when left uncut. The more often micro-clover is cut, the lower and more dense it becomes. In selecting new planting options, we always consider negative outcomes before recommending them. Micro-clover will produce a small white bloom which is good for pollinators but not for those with bee allergies. That said, its bloom is smaller and if mowed even occasionally, it is unlikely to bloom at all. Some reports warn against using it as a stand alone ground cover while others say it performs well in that application. We recommend micro-clover as a part of a seed mix blend. Pipolina micro-clover is not available in local garden centers. THE SHE SHED has it available for clients seeking to green up their lawn and enjoy the many benefits offered by this hardworking plant.